Here at Family Toyota of Arlington, we specialize in providing Arlington, Fort Worth, and Irving, TX area drivers with a superb selection of new Toyota cars and trucks at low prices. We stock the entire lineup of new Toyotas, including popular models like the Corolla, Camry, Camry Hybrid, Prius, RAV4, RAV4 Hybrid, and more. No matter your budget or credit history, we are sure to have a new or used car that fits your needs and lifestyle. Here at Family Toyota of Arlington, we aim to please; that is why our dedicated teams of Toyota specialists are standing by, ready to assist you with new or used Toyota sales and financing, Toyota auto service, and genuine Toyota auto parts. No matter what new Toyota you choose know that all new Toyotas include ToyotaCare, a no-cost 2 year or 25,000 miles maintenance plan and roadside assistance. Give us a call today at (682)227-8877! Are you shopping for one of Toyota's renown, fuel-efficient models like a Prius or Corolla? We carry the family of Prius models in strong supply, including the Prius, Prius C, a Prius V -- each of which offers excellent fuel economy paired with the versatility for everyday life. On Toyota's sophisticated sedans, namely the Corolla, Camry, and Avalon, style, fuel efficiency, and capable power come as standard. If you are looking to get in on the crossover craze, then Toyota has you covered with the ever-popular RAV4 and Highlander models, while SUV fans can find their next vehicle in the form of the Toyota 4Runner, Sequoia, or Land Cruiser. Other capable family haulers and people movers include the practical and surprisingly powerful Sienna minivan and the aforementioned Prius V wagon. Whether you are on the clock or off, Toyota's lineup of rugged pickup trucks is ready to conquer any tough job. The fun-loving Tacoma mid-size pickup and Tundra full-size truck are available here at Family Toyota of Arlington in a range of powertrains, cab styles, bed lengths, and packages. 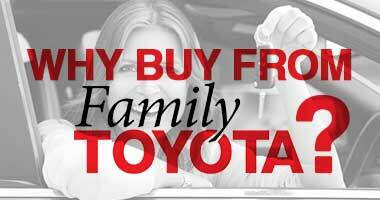 Why Buy at Family Toyota of Arlington? Here at Family Toyota of Arlington we offer something for every shopper, whether you are on a budget and looking for a used car priced under $10,000 or you want a little more peace of mind with an affordable certified used Toyota. If you opt for a Certified Pre Owned Toyota vehicle, you will get the added security of a rigorous certification process (including a multi-point inspection and refurbishing process), a full vehicle history report, an extended factory warranty, and 24-hour roadside assistance. Come by and learn more today! Alongside are a strong selection of new Toyotas you will find our extensive inventory of quality pre-owned cars, SUVs, and pickup trucks. We stock a range of used vehicles from a variety of popular automakers -- not just Toyota. Our Toyota Certified Used Vehicles are a great option for used car buyers who want extra peace of mind when buying a pre-owned vehicle, as they come with an updated warranty, and must meet stringent mileage, year, and inspection requirements. Our finance department is here to help when you find that new or pre-owned Toyota that you have just got to have. To get pre-approved for a new or used car loan, submit an online finance application here on our website while you shop and be sure to read about all the bad credit assistance we offer! Our Service Department is staffed by Toyota-certified service technicians and mechanics who attend to your car, SUV, or pickup truck with expert service and genuine OEM Toyota parts or Toyota-approved components. You can schedule your service appointment online, right here on our website. Arlington, Irving, and Fort Worth, TX drivers and car shoppers choose Family Toyota of Arlington for all of their Toyota automotive needs!